Continuing south, we arrived at the Venetian Causeway, a series of roads and bridges built in 1926 between islands in Biscayne Bay. 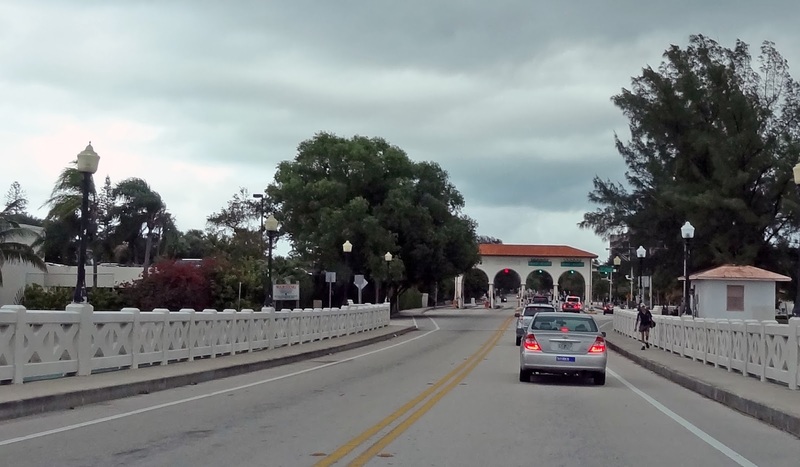 According to 'Historic Highway Bridges of Florida,' it is the oldest causeway in Miami-Dade County and consists of 12 bridges across one natural and five human-made islands. The causeway is about 2.5 miles long between Miami and Miami Beach. In 1913 a long timber trestle bridge was built from the mainland to what was to become Miami Beach. In 1925-26 the Bay Biscayne Improvement Company and the Raymond Concrete Pile Company replaced the trestle structure with the current bridges. Whenever an engineer finds out that an old bridge is supported on Raymond piles, he or she knows that an expensive repair job will be required, because these piles have almost no reinforcement. Many of these bridges underwent repairs from 1996 to 1997 but somehow they managed to retain their historic status. Much more information on this causeway is available in the above referenced book. Most of the bridges were built very low to the water and so the bascule spans are constantly opening and closing to allow passage of boats through the bay. All the bridges are very similar with crisscrossed concrete barriers and haunched concrete 'T' girder spans on pile extensions. Miami-Dade County, Florida Bridges: Venetian Causeway across Biscayne Bay by Mark Yashinsky is licensed under a Creative Commons Attribution-NonCommercial-NoDerivatives 4.0 International License.